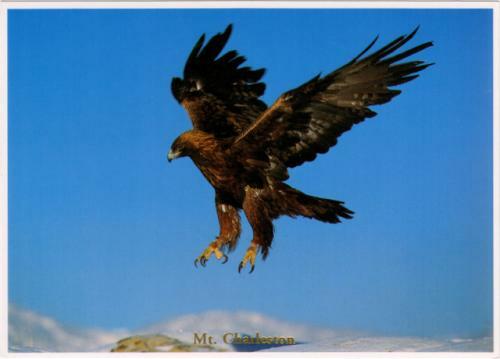 Postcard US-2711124 to the Netherlands shows a golden eagle soaring over the Mount Charleston near Las Vegas in Nevada. One of the best-known birds of prey in the Northern Hemisphere, the golden eagle (Aquila chrysaetos) is the most widely distributed species of eagle. Although considered hawk-like, these dark brown birds have a stance and bearing much like that of an eagle, with a soaring wingspan of 76-92", eyes with an "eagle look", and a "golden" nap. They build their nests with a large mass of sticks on a crag, ledge or in a tree, with a pair alternating between several nests in different years. Photo by Alan & Sandy Carey.